In her book Almost Christian, Kenda Creasy Dean reveals that American youth are ‘almost Christian – but perhaps not fully, at least not in terms of theology or practice.’ They are “almost Christian” in that they generally adhere to Christian principles but don’t live out a thought-through faith that affects their day-to-day living. 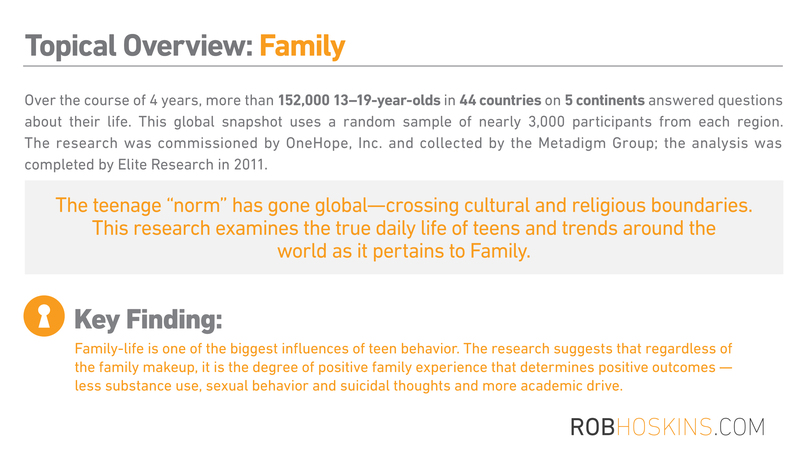 OneHope’s ABY study —which, to our knowledge is the largest of its kind—examined the daily life of teens and trends around the world. 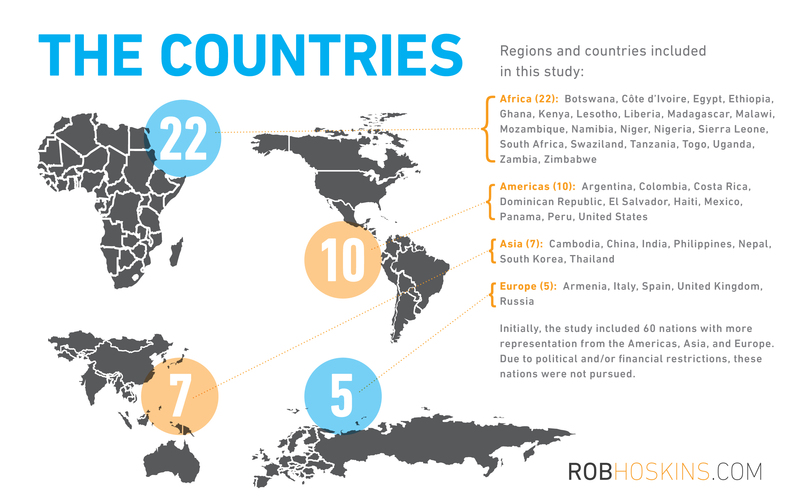 This fascinating study revealed that there is a global “teenage norm” that crosses cultural, regional, and religious boundaries. 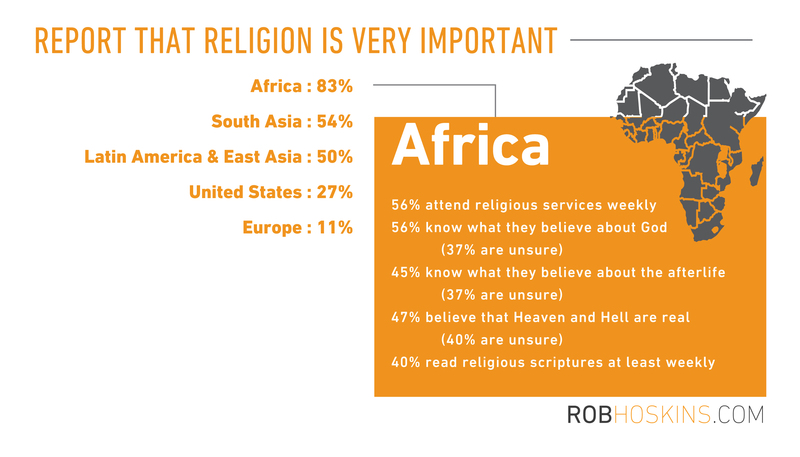 Take Africa, arguably the most religious (and Christian) continent in our present day – 83% of teens noted their religion as being very important (versus 54% in South Asia, 50% in Hispanic and East Asian areas, 27% in the USA, and 11% in Europe). But even in the most self-reported religious continent, 56% attend religious services at least weekly, 56% know what they believe about God (37% are unsure), 45% know what they believe about the afterlife (54% are unsure), 47% believe that Heaven and Hell are real (40% are unsure), and 40% read their religious scriptures at least weekly. We could spend all day debating “which came first, the chicken or the egg?”—whether disconnection comes before disengagement or disengagement comes before disconnection. It doesn’t really matter. What does matter is that we are at a tipping point. Youth disconnecting from faith and disengaging from the Church not only hurts the longevity of the Church, but it hurts the youth themselves. Sometimes we are asked why we focus on reaching children and youth. Our answer: engaging kids with the Gospel at a young age is mission critical. 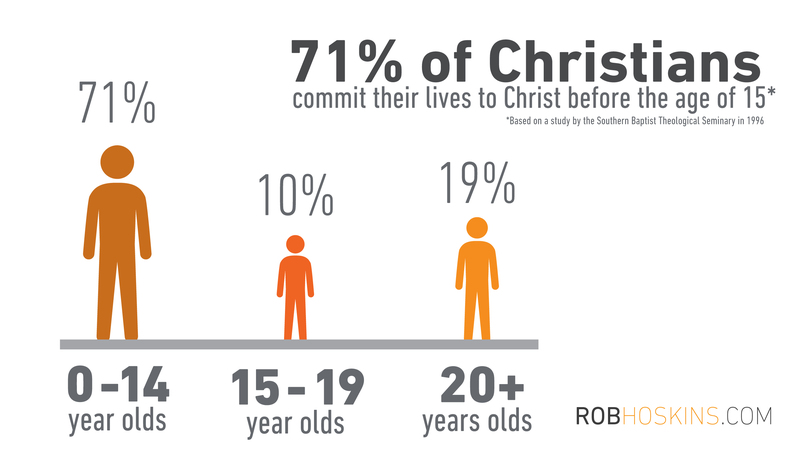 In the past 20 years, research has regularly reported that almost 3/4 of believers worldwide accept Christ before the age of 18, with the percentages dropping drastically after age 14. Our mission is “God’s Word. Every Child.” So we focus on engaging young people ages 4-14 with truth of God’s Word in age-appropriate formats. To help us figure out how to globally impact the next generation and turn the tides in favor of spiritual vibrancy, we have been researching what factors influence young people to lead healthy and faith-filled lives. The data portrays a vast difference between those on the highest and lowest ends of the spiritual vibrancy spectrum. We believe the message of Christ’s love and redemption speaks not only to a teenager’s eternity but also to his or her present reality. We found that the influence of positive family experience, involvement in a faith community, and engagement with religious texts make up the trifecta that makes a difference. Of the three, the factor most influential to teens was family. More specifically, teens noted that having positive family experiences played the biggest part in increasing their faith. Young people lacking parents of faith depend on the church to produce surrogate spiritual mothers and fathers to provide them with this healthy influence. Does knowing that family relationships and positive family experiences are the most important factor in the spiritual growth of a teen factor into how we are strategizing and carrying out our ministries? Ministries need to start taking into account the holistic health of an entire family if they want to achieve lasting results from their youth-focused ministry efforts. Great information and thanks OneHope for gathering it. I will use it in my radio program today. Family is so important, but it is more than knowing the Biblical principles, it is all about doing it. Jesus said many times, now that you know it, go and do it.